Doing something that causes a situation to become more troublesome and complicated. Example: Jessica has a coworker who smells bad. The coworker in question has been approached before about this issue, but his smelly ways have not changed. Jessica wants to talk to him about it, but she’s worried that doing so will open a can of worms. To put it another way, Jessica does not want to speak to her coworker about this issue because she feels it would make matters worse. Once the can is opened, things get hectic! Sort of. Burrowed underneath all of that soil in your backyard are a bunch of little worms. They prefer being underground because if they’re on the surface and are exposed to the sun for too long, their skin dries out and then they die. So it’s best to just leave them alone under all that dirt, that is, unless you’re looking for some bait. That’s right, if you plan on going fishing, it’s probably a good idea to have some worms with you to help lure the fish in. There are actually several different kinds of fish bait that can be used besides worms. The ‘spinner-bait,’ for instance, is made up of small pieces of metal that spin around as it’s reeled in. While this bait moves and spins through the water, it causes vibrations that imitate those of smaller fish swimming around. This, in turn, may fool larger predators into taking a bite. But this is besides the point; let’s get back to the worm. These wriggly creatures are sold in cans at fishing stores. 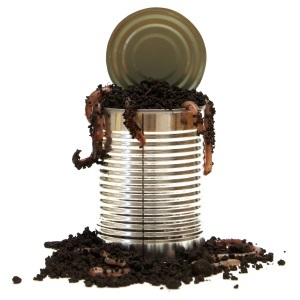 While fishermen are there shopping for supplies, they might decide to buy a literal can of worms. Later, when the time comes to open the can, what do you think will happen? The worms inside will try to wiggle their way to freedom, and with so many of them twisting and turning about, it can be a hassle keeping them all in check. Thus, as any fisherman knows, opening a literal can of worms can be troublesome. So I could see how this idiom would eventually develop from the chaos that ensues after opening one of these cans. My roommates are messy and I’m sick of it, so I told them that they need to start cleaning up after themselves. However, this only seems to have opened a can of worms, because now they’re arguing with each other. Tip: If you want to find more popular sayings, use the menu at the top.